Abstract. Palaeoelevation reconstructions of mountain belts have become a focus of modern science since surface elevation provides crucial information for understanding both geodynamic mechanisms of Earth's interior and the influence of mountain growth on climate. Stable oxygen isotopes palaeoaltimetry is one of the most popular techniques nowadays, and relies on the difference between δ18O of palaeo-precipitation reconstructed using the natural archives, and modern measured values for the point of interest. Our goal is to understand where and how complex climatic changes linked with the growth of mountains affect δ18O in precipitation. For this purpose, we develop a theoretical expression for the precipitation composition based on the Rayleigh distillation and the isotope-equipped atmospheric general circulation model LMDZ-iso outputs. Experiments with reduced height over the Tibetan Plateau and the Himalayas have been designed. Our results show that the isotopic composition of precipitation is very sensitive to climate changes related to the growth of the Himalayas and Tibetan Plateau. Specifically our simulations suggest that only 40% of sampled sites for palaeoaltimetry depict a full topographic signal, and that uplift-related changes in relative humidity (northern region) and precipitation amount (southern region) could explain absolute deviations of up to 2.5‰ of the isotopic signal, thereby creating biases in palaeoelevation reconstructions. 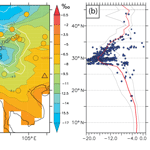 How to cite: Botsyun, S., Sepulchre, P., Risi, C., and Donnadieu, Y.: Impacts of Tibetan Plateau uplift on atmospheric dynamics and associated precipitation δ18O, Clim. Past, 12, 1401-1420, https://doi.org/10.5194/cp-12-1401-2016, 2016.